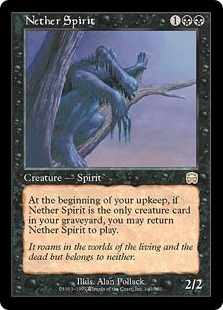 Card Text: At the beginning of your upkeep, if Nether Spirit is the only creature card in your graveyard, you may return Nether Spirit to play. Oracle Text: At the beginning of your upkeep, if Nether Spirit is the only creature card in your graveyard, you may return Nether Spirit to the battlefield. Flavor Text: It roams in both the worlds of the living and the dead but belongs to neither.